Our Two Brass Celtic Band Top Pocket Pewter Flask 3 Ounces measures 5.90 inches tall by 1.77 inches wide. 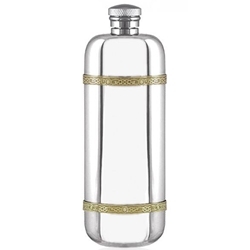 We always strive to produce beautiful and elegant pewter giftware and we believe that we have really hit the mark with this three ounce Celtic style Golden Kells pewter hip flask. The slim line shape is wonderfully decorated by a brass Celtic band at the top and bottom to give the flask an understated bit still striking appearance, and the mirror like finish makes it ideal for the addition of engraving to turn it into a truly unique gift. Lovingly crafted from the highest quality pewter, the flask will not tarnish. Supplied in an elegant cream and black presentation box this stylish hip flask is sure to be well received by your loved one on any occasion.